Escape the hustle and bustle of Paris with a day trip to the historical sea side in the north of France. The Normandy Beaches and the World War II Memorials bring history to life through scenery and nature. The beaches of Normandy give travellers a chance to explore an area of France rich not just in history but also in food. Luckily traveling there is made easy even for those who don’t have cars as there is a Paris to Normandy train! This INSIDR Guide aims to give you a a brief yet comprehensive D Day Beaches guide. You’ll find our tips on how to get to Normandy from Paris and catching the train from Paris to Normandy! The Normandy beaches are located at approximately 250km / 155,3 miles from Paris and the average time to get to the most famous D-Day beach Omaha Beach from Paris is 3 hours. To get to Normandy you will have to take a train from Gare Saint-Lazare in Paris to Bayeux train station. You may have to change at Caen to take a train to Bayeux as not all are direct. Reserve seats on one of the 7 trains per day through SNCF, this round-trip is around 82€. Once in Bayeux at the train station you should take the Bus Vert number 70 in the direction of the D-Day beaches. The first bus leaves at 12:45pm on the weekdays in this direction. The round trip on the bus from Bayeux train station to the D-Day beaches is 4.30€. From Bayeux train station Bayeux Taxi offers day tours to The American Cemetery and Omaha Beach from 70€. These multiple destination tours last from 2 hours and 30 minutes onward. To find a list of the options of the tours of the Normandy Beaches see the Bayeux Taxi and be sure to schedule in advance. Paris City Vision offers day trips to the D-Day Beaches from Paris. Departure is at 7am and returns at 9pm. This trip includes the memorial service, the D-Day Beaches, the Caen Memorial, and lunch. This full-day excursion to the Normandy D-Day Beaches is 180€. There are many options for car rentals in Paris and the Paris area. Renting a car in Paris to get to the Normandy Beaches can start from 59€ a day. Once in a rented car – to get to Bayeux, Normandy and the D-Day beaches take the A13 motorway to Caen. At Caen take the motorway N13 then take exit 36 in the direction of the Normandy Beaches. How much time is needed to visit the Normandy D-Day sites and American Cemetery? More than a few hours is necessary to visit all the D-Day Beaches and the American Cemetery. This time period should be extended based on the amount of time spent at each beach and if travellers plan to visit any of the extensive museums or memorials in the area. A long day trip should be sufficient to see the D-Day beaches and the American Cemetery. Remember to take travel time into account! 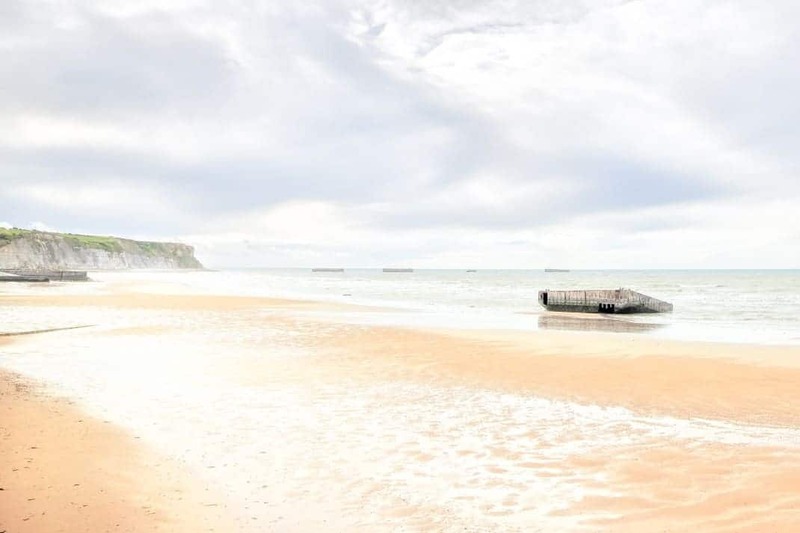 WHAT ARE THE BEST SITES TO SEE AT THE NORMANDY BEACHES? The D-Day Beaches include Pointe du Hoc (the highest point during the Normandy landings, heavily fortified by the Germans), and the Utah Beach, Omaha Beach, Gold Beach, Juno Beach, and Sword Beach (the five points of entry for the Normandy landing of the Allied forces in German-occupied France). The beaches give a insight to what World War II was and how the D-Day Beaches played a major role. Pointe du Hoc has a beautiful view of all the beaches and is a must see for the Normandy Beaches. Omaha Beach is the most popular travellers destination of the D-Day Beaches. To find the exact locations of these historic beaches, download our D Day Beaches Map! This memorial is one of the 14 permanent American cemeteries on foreign territory and is one of the biggest. The American Cemetery is in Colleville-sur-Mer. With 172.5 acres of land this memorial gives a face to the history. These are where travellers will find the iconic white crosses in remembrance along the green grass. The newly renovated museum offers an eye into many world conflicts such as The Battle of Normandy, World War II and the D-Day Beaches, The Cold War, and Total War. This memorial is huge and is recommended to have at least 4 hours to visit its entirety. WHEN IS THE BEST TIME TO VISIT THE D-DAY BEACHES? June 6th is the remembrance of D-Day for the United States, therefore this time of the year is quite busy. September is an off-season time to visit the memorial and the beaches with some decent weather still. WHERE TO HAVE LUNCH WHEN VISITING NORMANDY BEACHES? In Bayeux, travellers often enjoy Le Ptit Bistrot. Here one will find a typical 3 courses French menu starting from 16,90€. Enjoy a moments rest with a beautiful local glass of cider from Normandy. The laid back atmosphere and the large portions attract hungry travellers who have been exploring all day. This beautiful wine cave also doubles up as a small bistro in Bayeux. Be sure to head to this place to not only find incredible wines but also fantastic cuisine. Enjoy a glass of wine at the small bar while watching your food being cooked in the kitchen behind. Local products are used to ensure the finesse of your food, all the meanwhile, you’ll be enjoying the relaxed, friendly, local atmosphere. WHAT ARE THE BEST TOWNS TO STAY WHEN VISITING NORMANDY BEACHES? Deauville is 1 hour away by car or public transport from the Normandy Beaches. The drive to Deauville from the Normandy Beaches passes along the shoreline and gives stunning views. Once in Deauville see a chic side of Normandy with enormous Normand style houses, beautiful boutiques and cafes. Deauville allows travellers a relaxed environment with a city centre just steps away from the beach.